The first year I lived in Sevilla, to make ends meet, I began to sell paintings for John Fulton, the American Matador who lived in Sevilla for decades, made his living as an artist and was featured in James A. Michener's best-selling book on Spain, Iberia. 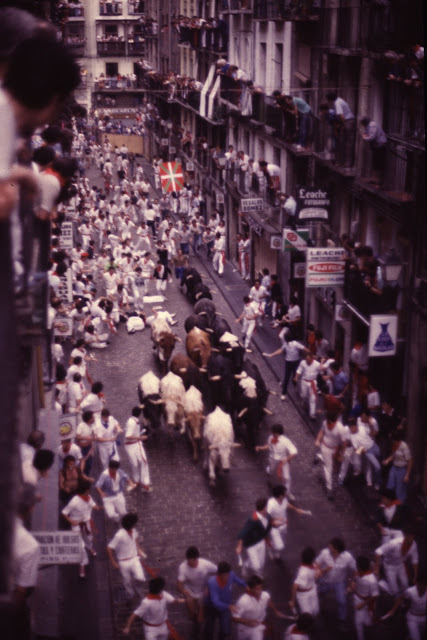 In early July 1970, Fulton and I found ourselves flat broke and itching to go to the Fiestas de San Fermín in Pamplona, a place I had only read about in Ernest Hemingway's The Sun Also Rises and in Iberia. On July 6, the day the fiesta actually begins, as I was walking through the narrow corridors of Sevilla’s Barrio de Santa Cruz, where with girlfriend (and late ex-wife,) I was renting an idyllic apartment, I encountered an affluent-looking group of American college students. As they filed by me in the narrow street, I couldn’t help thinking that many of them had undoubtedly read Iberia and, if only there were a way to introduce them to Fulton, I was sure they would at least buy some lithographs and books and we could possibly finance our trip to Pamplona. 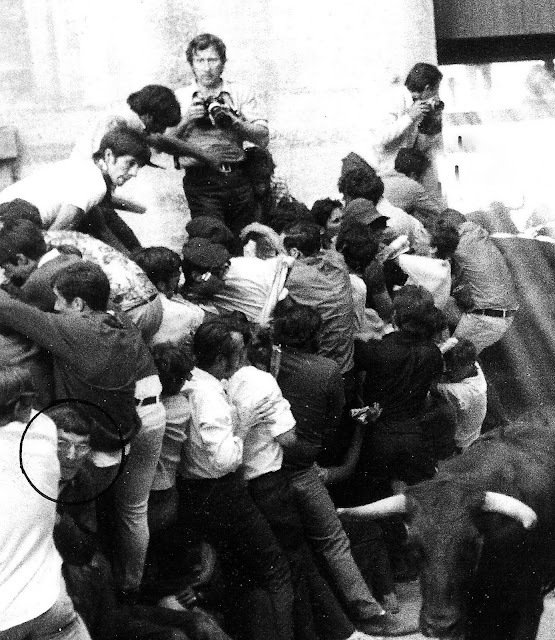 in the famous montón, the pileup, on July 8, 1970. Fulton had printed some little cards with a picture of him in his traje de luces (suit of lights). It had some “propaganda” inside about being the American matador-artist featured in Iberia. As the one of the last students in the line passed me, I handed him several of the cards and told him if the group was interested in meeting John to call me. Within the hour, they called, asking if they could meet John Fulton. I bought some cheese, chorizo, olives, and bread and several bottles of red wine for 10 pesetas a liter, made sangría, and got Fulton and the students together for a party in the open-air patio at my house in the Barrio de Santa Cruz, where I kept a display of Fulton’s art. The students were thrilled to meet the famous matador. They purchased so many of his lithographs and books that we earned enough money to leave for Pamplona the next afternoon, July 6, the day before the first of the eight San Fermín encierros was to be run. 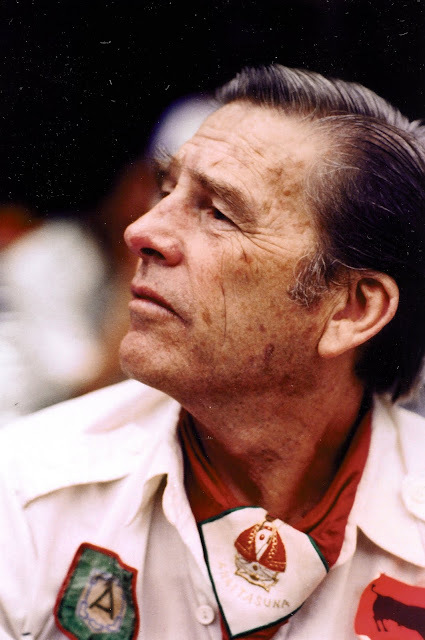 Fulton, Bill Cimino (an aspiring young American bullfighter Fulton was tutoring), and I piled into John’s little green Seat sports car and left Sevilla in the afternoon, intending to drive all night and arrive in Pamplona in time to run the bulls on the morning of the seventh. We drove across the scorching plains of La Mancha and into the highlands of Castile. Fulton took the mountain roads via Soria to Logroño in the darkest hours of the night and the predawn of July 7 found us racing around curvy roads that followed trout streams rushing through tall woods. On bicycles, fishermen in hip boots with fly rods and wicker creels slung across their chests pedaled out to fish them. A family of bright-eyed foxes scurried across the road in front of us and disappeared into the woods. It was just past six as we drove through Romanesque Estella. The sun was rising from the direction of Pamplona and it came up over the hills in a bright ball. A few clouds drifted over the sun. At first Fulton and I teased them into cloud sculptures with our imaginations, then they began to take on shapes of their own. “How about the one in front of it?” Fulton pointed out another shape and the images grew more lifelike for a few brief moments and then began to break up, but not before they had been engraved in my mind. First we had seen a runner in the sky, then the cloud behind him become a bull, his head down, his horns searching. I told Fulton this would make a fantastic lead for a story on San Fermín. The elation I felt at having what bordered on a mystical encounter faded in the face of the experienced matador’s logic. After all, I had never even set foot in Pamplona, and I was ready to let a trick of my imagination lure me into conclusions about an event I had never even seen. It was still half an hour before the bulls for the encierro would be released from the corrals at the bottom of Santo Domingo hill in Pamplona. We wanted to reach Pamplona in time to run, but we were behind schedule. Even so, I urged Fulton to make a quick stop at the first open bar we saw. I had already figured out that one must be very brave, very crazy, or very drunk to get into the streets with a string of fighting bulls. I also calculated that, not only was I lacking in the first category, I was not far enough along in the second, so I decided a bottle of brandy might help me emulate some of both qualities. We drove on through Puente la Reina, Legarda, and Astrain without seeing a bar open. My nerves were rapidly failing, when Fulton announced that it would be impossible to reach Pamplona in time to run in the encierro. Suddenly, I felt I could run with the bulls. Now I lamented our being late. Just minutes before seven o’clock, the hour the bulls were turned loose in those days (before national live television coverage required an eight o’clock start for more light), we reached the area near the legendary teléfonos dogleg, parked the car, and ran toward the encierro route. We were able to climb up on a truck just in time to watch the tail end of an uneventful run. A mass of runners, bulls, and steers swept past our vantage point and it was all over in a few seconds. The whole thing looked simple, but I was far from convinced that anything involving hundreds of alcohol-fortified runners being pursued by a pack of fighting bulls could be that easy. After the encierro, we walked over to the Plaza del Castillo and within five minutes I found myself sitting at the same table at the Bar Txoko with the legendary Matt Carney. Carney was as handsome as Michener had described and he was in fine spirits. I was excited to meet Carney after all I had read about him in Iberia, but I was a little apprehensive about his reputation as a brawler. When Fulton introduced me to him, Carney flashed his famous Irish grin and something about him made me feel I belonged, that I was no newcomer, no outsider, at his table. Over the years, I would subsequently observe Matt welcome other people to the fiesta in much the same way. Carney had a big heart and his idea of San Fermín was a fiesta of sharing, not of exclusion. But, today, my first day at San Fermín, I was going to see both sides of the coin. Within ten minutes after we had pulled up chairs around Matt’s table, his demeanor suddenly changed. “That’s a lie,” I heard him say. Then he shouted, “You’re a goddamn liar. Take that back, I said, take it back!” He jumped up and hit the spectacle-wearing man sitting beside him. I was sure that Carney regularly blew up like Old Faithful and that after Iberia was published, he must have thought it was his duty to keep up his brawling since, along with his bull-running, broad Irish smile and gravelly jota singing, his whole persona now bordered on a conjunto artistico-folklorico, an artistic-folkloric ensemble on the verge of being declared of touristic merit. Nothing could have been further from the truth. I subsequently knew Matt Carney for another 18 years and spent parts of ten sanfermines with him. Other than the slapping around of David Black, known far and wide as “The Dirty Old Man” and a man so contemptible, obnoxious, and purposely provocative that there are few regulars at Pamplona who had not hit him, I saw Matt Carney in just one other fight—during the legendary night of the giant Angelino at the Bar Txoko about which we will hear more later. But first I had my date with the encierro. Unlike Hemingway’s “men and boys of Pamplona,” I was not out for “a morning’s pleasure” when I ran the bulls. And unlike most of the foreigners—many of them American college students who read The Sun Also Rises in American literature classes or Iberia in Spanish classes—who had come to Pamplona on a lark to run the bulls, I had seen enough corridas de toros, more than one hundred at the time, to have developed a very healthy respect for the Spanish fighting bull. But, since every man who goes to Pamplona—except for the very crippled and very old (and even some of them run)—is expected to run the bulls at least once, I felt I had to, especially since I had come to Pamplona with John Fulton and Bill Cimino, who called himself León Camino. He was as brave as a lion—in fact, maniacally brave. After we had missed running in the encierro that first morning, I felt like a kid whose dental appointment had been canceled. Yet the inevitable had merely been postponed. Still, I kidded John Fulton all morning in the Bar Txoko, claiming the brave matador had caused us to arrive late so he wouldn’t have to run the bulls. Fulton reminded me that the bulls to be fought in each afternoon’s corrida were run each morning of the fiesta. He would have several more opportunities to prove himself, he said, and so would I. Early on the morning of the eighth of July, Fulton aroused me from a restless sleep. Bill Cimino was having no part of the encierro. He groggily informed us that if he were to die on the horns of bull, it would be in the glory of the bullring, not in the anonymity of the street. He rolled over and went back to sleep. Shortly before seven a.m., we crawled through the double row of heavy timbers, that are put up each morning to barricade the citizenry from the mayhem, and clustered at the traditional gathering place in front of Pamplona’s storybook ayuntamiento (city hall). We were six: Fulton, the late writer Toby Williams, Ron Vavra (the twin brother of Iberia photographer Robert Vavra), U.S. Navy Commander Dennis Fish from Rota, a Marine captain, and me. Only Fulton and Williams had ever run the bulls. I entertained no illusions of glory. I wanted to run far enough ahead of the bulls to say out of danger, but close enough to get a glimpse of them behind me, then sprint into the bullring at the end of the course and vault over the fence to safety. This little romp would earn me my imaginary bull runner’s merit badge, lend credence to my claims to manhood, add a few lines to my dinner party repertoire, and gain me acceptance with the Pamplona regulars, that international group of Hemingway’s spiritual descendants who return to San Fermín each July to revel in the light of a sun that for them always still rises. Hundreds of runners and thousands of spectators were converging along the 850-yard course that runs uphill from a corral at the bottom of Santo Domingo hill through the barricaded streets of Pamplona’s old town. At the bullring every morning, a packed house awaits the exciting entrance of bulls and men as they come pouring through a narrow passageway. The plaza in front of city hall was filling with runners—men and boys, not just from Pamplona, but from all over the world. Many appeared to have been drinking all night; their white fiesta costumes were soiled from sleeping, and often wallowing, in the streets and from poorly aimed botas, the ubiquitous wineskins that fuel the fiesta. Even at this hour they staged impromptu drinking contests, seeing who could take the longest draughts of Navarra wine arched from botas held at arm’s length. Others danced the jota and the riau-riau, the infectious folk music of Navarra, which blared from poorly wired loudspeakers. From behind polished brass lions gracing the balconies of the fairy-tale façade of Pamplona’s city hall, the city fathers surveyed the bacchanalia with an air of paternalistic tolerance. Wives, daughters, and nuns watched with demure amusement from their privileged perches. Pretty Basque girls looking for their favorites leaned out from the balconies of the houses lining the narrow streets. Tourist and native alike strained for a better view or camera angle from the timbered barricades surrounding the plaza. The crowd of runners grew larger. Our group waited, close-knit and nervous. We mangled the rolled-up newspapers Fulton had advised us to bring. Tradition has it that one is supposed to be able to ward off an imminent goring by whacking a bull on the nose with a newspaper. As we waited Fulton told us about the runners down on Santo Domingo hill—the “crazies” who run toward the bulls. They work up their courage by singing to a statue of San Fermín which occupies a special niche overlooking the street. As they sing, they thrust their rolled newspapers skyward to the image, invoking the saint’s protection. San Fermín is said to intervene on behalf of fallen runners, suddenly appearing with a cape to distract a bull about to spike an endangered mozo, as the Navarrese affectionately call those who run. It was of no solace to me that San Fermín was unable to intervene in time in 1969, just a year earlier, and two runners were killed at Jim Michener’s feet as he stood in a doorway on Santo Domingo. Fulton, professional matador and veteran runner, had volunteered to initiate us into this time-honored fraternity. Scared, but trusting as Boy Scouts on our first hike, we listened intently as Fulton explained how he runs the bulls for maximum effect and minimum risk. He encouraged us to pace ourselves and stay with him. We were to arrive at Teléfonos, the telephone office corner, at the top of the hill where the street doglegs left into the bullring. We would stop there and wait for the bulls to come up the famous canyon-like street, calle Estafeta. Each of us could then decide just how close he wanted the bulls to get before running for the bullring. The hands on the city hall clock inched inexorably toward what the Spaniards call la hora de verdad, the moment of truth. The crowd of runners was straining against the line of police who were keeping them from moving into Doña Blanca de Navarra (now named Mercaderes) and Estafeta. Shortly before seven, they allowed the mass of runners to move into the empty streets ahead of them and many began running. I stayed close to Fulton, as did most of the rest of our group. We walked and half-jogged along the cobble-stoned Estafeta, which is the long uphill straightaway on the course. At 7:00 a.m. sharp, a rocket streaked into the sky above the old quarter and a loud report signaled the release of the bulls. At that moment, several steers and seven fighting bulls were pouring into Santo Domingo, some 500 yards down course from our position and out of sight because of turns in the street. When I heard the rocket, I was ready to streak for the bullring, but Fulton encouraged me to wait. By the time we reached Teléfonos, runners were flying by us like proverbial bats out of hell. We looked back down the Estafeta, but we still couldn’t see the bulls. The confusion of noise, motion, and dust from the rush of runners caused a further drain on my rapidly diminishing supply of machismo. I decided I was quite ready to follow the last of Fulton’s instructions: Run like crazy into the bullring, break off to the left, and vault over the bullring fence to safety. I started to take off. A familiar voice—Fulton? Williams?—shouted, “Hey, don’t you even want to see them?” In the confusion, I actually paused to consider the question—a big mistake. It was like being on the way to an air raid shelter and having some fool ask you for the time. I actually turned to say, “No!” As I looked back, I saw a mass of runners stampeding toward me. Behind them was an ominous space, a swath being cleared by the bulls. I raced for the tunnel leading into the bullring. I intended to get into the ring and over the fence—fast. The rest was a nightmare. Reaching the tunnel, I found a montón, a pileup. Several runners had fallen and others had tripped over them as they frantically tried to get through. The pile was building; the entrance to the bullring was blocked. The bulls would be on us in seconds. My first impulse was panic. I tried to climb over the pile like everyone else, but it was futile, so I chose the only alternative: I would have to take my chances in the pit with the bulls. I withdrew from the pile with the irrational idea of spreading myself along the wall of the tunnel like a coat of paint. Unfortunately, other people had similar thoughts, they were already making like coats of paint two and three deep along the wall. We pressed against one another hoping that we could somehow fuse and become indistinguishable from the concrete. Matt Carney at Bar Txoko, San Fermín, early 1970s. The bulls charged into the tunnel and ran into the pileup. They were stopped by the human barricade and began to mill about in the confusion. I found myself being jammed against the runners behind me by a huge brown fighting bull from the ranch of Juan Pedro Domecq, one of the most respected ranches in Spain. Luckily, I was left standing along his flank when he stopped. For now, at least, his horns could not reach me and his body was shielding me from other bulls. For some reason, I thought I might be able to push the half-ton plus animal aside so I could get out. I put my hands on his massive sides and shoved. He didn’t budge an inch. I remained trapped for several moments. It seemed an eternity. El encierro, Pamplona, July 8, 1970. I (circled) am looking towards a toro suelto (a bull separated from the herd and thus, very dangerous, since he will often attack anything that moves or go along the fence hooking anything in his path with his horn--called "limpiando la pared" ("cleaning the wall"). The animal in the picture is a steer (there is a cowbell around his neck), not a toro bravo. Luckily, the loose bull did not hook everything he saw along the fence. The lead bulls struggled like floundering swimmers through the pileup. Fortunately, they were so disoriented that they were not trying to gore anyone, but they were trampling the fallen. When the first bulls broke through into the plaza, they attacked and several people were gored. Finally, the big brown bull moved. I freed myself and followed a group of runners heading back down the course to escape the bulls. We knew that if the remaining bulls were frustrated in their attempt to go forward, they might turn and wander back into the street. I got out of the tunnel and ran for the nearest fence, but dozens of people were already up on the barricades. They climbed just high enough to save themselves. Once out of danger, they stopped to enjoy the spectacle. Since I couldn’t get up the fence, I positioned myself against it. There was an animal in front of me, but I saw the bell around its neck and realized it was one of the steers that run with the bulls to help keep them in a pack. Then I saw the most frightening thing a runner can experience outside of a pileup: A toro suelto, a bull that has become separated from the herd. Such loose bulls often take the offensive, attacking anything that moves, sometimes “cleaning the wall,” going along a wall or barricade hooking everything they encounter. I froze, peering out from the line of men along the fence, hoping the bull wouldn’t go for us. He turned and glared at us for a long moment, but no one moved enough to provoke a charge. He suddenly wheeled and ran toward the bullring in search of his brothers. Now, my thoughts turned to my friends. I saw Fulton on a barricade across the street. After the bull passed, he climbed down and ran back into the tunnel. I foolishly followed him. As I caught up with him in the bullring, he ordered me to stop in my tracks. The last bull, the toro suelto, was still loose in the ring. We stayed still until one of the official ring attendants lured the bull into the corrals with a cape. A rocket signaled the end of the encierro. The normal run lasts from 2 ½ to 3 minutes from the time the bulls are released from the Santo Domingo pens until they are herded into the bullring corrals a half-mile away. We would find from reading the local newspapers, that today’s encierro had taken 6 minutes, 41 seconds (they are officially timed), one of the longest in history. One reporter wrote that the only other pileup to rival ours occurred in 1947 (another legendary pileup happened a few years later and that I will touch on it with a humorous story about Noel Chandler). Our group had been lucky. None of us wound up in the hospital. Later, we read that nearly 50 runners had required medical attention and that one man, first reported dead, was critically injured. We found Ron Vavra bleeding from a long scrape on his nose. A bull had shoved him face-first against the concrete wall of the tunnel. Fulton and Vavra had been trapped on the opposite side of the tunnel from my position fighting off horns and hooves for several minutes. At one point, Vavra had looked at Fulton, a yard away through the common frame of a pair of horns, and said, “Man, we are in trouble.” Fulton had a long, painful bruise along his thigh, where a huge steer had mauled him with its hooves. The other members of the group were unaccounted for, but I had seen the Marine captain go up the fence, so I was sure he was all right. Dennis Fish soon joined us; he had avoided the pileup. Later, we found a slightly battered Toby Williams sitting in the Bar Txoko, drinking a double brandy. I remained in the bullring with Fulton for the morning capea, or amateur bullfight. To the delight of a capacity crowd, cows with leather caps over their horn tips are turned loose to wreak havoc on a mob of daredevils. The cows, vacas bravas of fighting stock, are two to three years old; they are strong and charge ferociously. 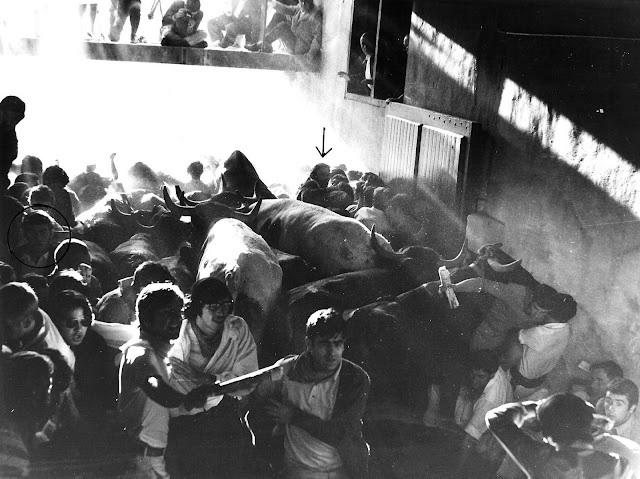 Before the toril (gate to the bull pens) is opened to let one of these cows into the arena, a group of demented young men gathers in front of the gate to take the first fresh charges of the animal with their bodies. After the cow tears into the pile, she races around the ring smashing “the men and boys of Pamplona” (and not a few foreigners) like figurines in a china shop. Fulton unfurled his newspaper and managed to get off a nice pass to one of the cows. When they let out a particularly large animal with no protective leather on its horns, I decided enough was enough and vaulted over the fence to safety. When the capea was over, we strolled over to the Plaza del Castillo, where Williams was holding a table for us at the Bar Txoko. The cheap, coarse brandy we ordered was bracing; it steadied nerves and loosened tongues as we recounted our adventure and basked in the glory of having been in the breach. As I listened to the retelling of the morning’s events and added my own embellishments to this colorful tapestry of personal legend that we were all weaving, I sensed that something very important was missing from our descriptions: It was the powerful animal smell in the close air of the tunnel that was the most realistic element in the dreamlike sequence of events. That detail had been lost amid the surreal mix of noise, dust, fear, confusion, and excitement in the tunnel. But the smell of the big brown juanpedro bull was still on my jacket and on my hands. I never ran with the bulls again. "I can't tell you how much pleasure reading this excerpt gave me, Gerry. I have never been to Pamplona, yet your vibrant account, the names of people I only met once or twice, but who are legends, seeing Rolf with whom I spent a little time in Sevilla, the memories of corridas at the Maestranza, all made my love for Spain (and especially Andalucia) whoosh over me like a typhoon. My heart is still pounding with longing, recollection, and eagerness to see it all again. Gracias." Thanks for a wonderful story of the encierro. I never had the pleasure of knowing Matt Carney, but for a while I was an acolyte of Joe Distler, his heir, and Joe taught me to honor the traditions of the Sanfermines. I had many memorable runs, and, thankfully, I never encountered a monton. If I may be so bold, I offer the possibility of one minor correction. I believe it was in Michener's "The Drifters" I read that Puente la Reina means The Queen Bridge, not the Bridge of the Queen (which would be Puente de la Reina, no?). Regardless, it's a lovely little town, even if the bridge seemed less than overwhelming. By contrast, I was astonished to enter one of the churches there, so drab in its exterior, to find floor-to-ceiling hammered gold behind the altar. My jaw dropped. Anyway, if I ever hit the lottery, I'm coming on one of your tours. Many thanks for you kind comments and for the correction. You are absolutely right and I know that, since I have stopped there to see that bridge, which I think is wonderful (it is great to photograph, with the reflections of the buildings in the water and catching a pilgrim crossing), on more than a score of occasions. Joe Distler is one of my dearest friends of longest standing. I have known him since 1970, when I first met him at the Bar Txoko and obnoxiously told him, "It is Americans like you who are going to ruin Spain." I am lucky that he did not punch me out. He often reminds me of that statement and, if we are in Pamplona, I just grin and say, "just look around, Hotel Quintana is gone, there are foreign drunks everywhere, the Estefeta no longer has cobblestones, etc." Thanks for looking in on my excerpt from Homage to Iberia. For a long time now my own backroads (and work) have been in Italy, which I adore. But it has been at the cost of neglecting Spain, my first love, and a country that spoke to a different part of me, now too much neglected. Amazing how those words of yours made me yearn. I raise a glass of tinto in your direction, dear Gerry. Running with the bulls is on my bucket list. I wonder how possible it is today to get into the streets considering the media hype around it. That’s a good read. And it reminds me of one of my favorite quotes. “ bad decisions make for good stories”. Oh, I wish I could have been there in the '70s or even earlier, Gerry. I'm glad you have such superb memories to relate. I think I would have been a good fit back then. As much as I loved my time in Pamplona, it seemed a more crass and commercial event than how I imagine it was a few decades earlier. I made a few friends among the locals, but not enough. Unfortunately, I do not speak Spanish, although I was picking it up a bit more each year. Some of my best memories were wandering into some local bar/restaurant and being embraced by natives who insisted I/we stay and eat and drink with them. They really are welcoming people, and it warmed my heart. Also, I love the photos of the encierro when it was possible to run without a shoulder-to-shoulder crush. These days, you see mozos grabbing and pulling one another in nearly every photo. How Julian Medina manages to run unencumbered almost every day is miraculous. One day, he and Joe Distler were having a photo taken together, and Joe insisted I join them. It was like having my photo taken with Joe DiMaggio and Mickey Mantle. Hey Gerry, Love the book (Homage to Iberia). I am living in Texas next to the only bullring in the US where they fight bulls(bloodless) like they do in spain. John Fulton was here with Matt and CP Scanlon. They hunted here. Fred Renk owns the place and his so...n , David Renk, El Texano, is a Matador de Toros. Thanks for posting the fine pics of Matt, again. They are great. Keep them coming.